previous post: The ‘World’s Wrongest Man’ at it again – when does credibility evaporate? I have documented Australia’s move toward becoming a nation of part-time employment. See latest assessment – Australian labour market – continues to deteriorate – fiscal stimulus needed. The ABC business editor wrote an interesting piece yesterday (October 25, 2016) – Underemployment phenomenon emerges with rise of part-time workforce. This was written following last week’s labour force data release where full-time employment continued to crash and “the rush towards part-time work gathered pace”. Underemployment has risen dramatically in Australia over the last 25 years and there are now 1,0110.1 thousand persons underemployed (8.7 per cent of the labour force) and, on average, they seek around 15 hours extra per week. A huge shortfall of working hours available is thus evidenced. The claims made by those who support further deregulation of the labour market is that the trend to part-time work is a reflection of choices made by families – the so-called work-life balance nonsense that is peddled to cover up the massive and growing deficiency of jobs and working hours on offer. In the 1970s, when social changes permitted for the first time married women to combine family duties with work and the growing service sector accommodated those desires, one might have been able to argue that the availability of fractional hours was desirable and a reflection of individual choice. After the 1991 recession, underemployment – that is, part-time workers who desire to work longer hours but cannot find them – started to rise sharply and has remained at elevated levels ever since. This is not a chosen state. It is another manifestation of a deficiency of total spending in the economy just as unemployment and hidden unemployment signal this. Underemployment is a systemic constraint on the ability of workers to realise their desired ends. It is thus an inefficiency. A recent report, discussed in this ABC news commentary (October 1, 2016) – University graduates struggle to find full-time work as enrolments increase, study finds – shows that the problem of deficient spending in the economy is penetrating areas and cohorts that previously were relatively immune from economic crisis. The difficulties are greater for graduates in language and literature but the decline in full-time employment opportunities has impacted across all the disciplines. The same trends are apparent in other nations, particularly the euro zone where economic stagnation is undermining the opportunities for a whole generation of young adults. 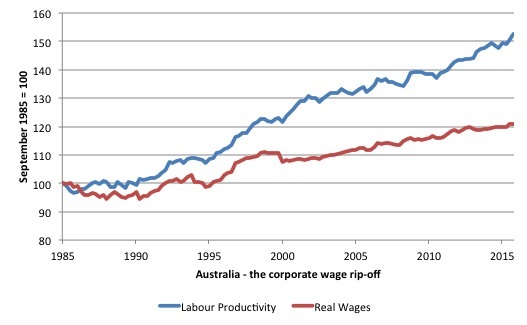 I have also documented the on-going real wage suppression in Australia. My latest blog on that topic is – Australia – stagnant wages growth continues. US economist Richard Wolff has documented a similar trend in the US. Although I do not agree with the way he thinks government finances are in trouble because of corporate tax avoidance, I do concur with many of his insights concerning the wage rip-off – where higher proportions of national income are being expropriated by capital. I have posted graphs like this one before which shows the indexed growth in real wages (red line) from the September-quarter 1985 to the June-quarter 2016 (total growth 20.9 per cent) and the growth in labour productivity per hour (blue line) over the same period (total growth 52.7 per cent). I have usually presented this type of graph within the context of the underlying causes of the GFC. Productivity growth provides the ‘non-inflationary’ space for real wages to grow and for material standards of living to rise. But, one of the salient features of the neo-liberal era has been the on-going redistribution of national income to profits away from wages. When real wages lag behind productivity growth, the wage share in national income drops and vice versa. The pattern in the graph tells us that an increasing share of the extra real income produced in Australia over this period has been expropriated by capital in the form of profits. Where does the real income that the workers lose by being unable to gain real wages growth in line with productivity growth go? Answer: Mostly to profits. One might then claim that investment will be stimulated. But investment ratios have also fallen in most nations. This feature is present in many nations. I could have drawn this graph for any number of nations and it would more or less the same. The suppression of real wages growth has been a deliberate strategy of business firms, exploiting the entrenched unemployment and rising underemployment over the last two or three decades. The aspirations of capital have been aided and abetted by a sequence of ‘pro-business’ governments who have introduced harsh industrial relations legislation to reduce the trade unions’ ability to achieve wage gains for their members. The casualisation of the labour market has also contributed to the suppression. I consider the implications of that dynamic in this blog – The origins of the economic crisis. The substantial redistribution of national income towards capital over the last 30 years has undermined the capacity of households to maintain consumption growth without recourse to debt. One of the major reasons that household debt levels are now at dangerous, record levels is that real wages have lagged behind productivity growth. As a guide to the future, without fundamental change in the way governments approach wage determination, the world economies will remain prone to crises. The ABC report cited above – Underemployment phenomenon emerges with rise of part-time workforce – makes an interesting point. Until now, the prospect of a cheaper, highly skilled and more flexible workforce has thrilled many in the business community. But it now is starting to dawn that those in the workforce also play another vital role in the economy. While they may be a cost at work, they are a source of revenue as consumers. Your workers are your customers. If workers earn less, they spend less. If they have less secure jobs, they are denied, or at the very least find themselves severely limited to, access to credit. At some point, that will begin to impact consumption patterns which will flow through to corporate earnings. I am increasingly seeing references and analysis of the growing underemployment problem in publications that previously had ignored this problem. For example, investment bankers are now writing about it. While it’s easy to say ‘about time’, it is better to adopt a more optimistic position and believe that something might be done about this the problem, given that the financial elites are starting to worry that their fortunes might be compromised as a result. The “Your workers are your customers” point was a major breaking point for Keynes from the neo-classical view in the 1930s. The latter considered the cure to unemployment was real wage cuts. Keynes noted that wages are, on the one hand, a cost (supply variable), but, on the other hand, they are a major component of income and consumption potential (demand side). Cutting wages might reduce unit costs (if you assume the impact on morale doesn’t undermine productivity growth) but it also undermines total spending in the economy, if done on a national scale. The experience in the early days of the Great Depression, where real wage cuts were engineered, was clear. The situation deteriorated further as aggregate spending declined. I also read another article recently – 80 percent of U.S. adults face near-poverty, unemployment, survey finds – from July 28, 2013, which bears on this theme. I guess this is the tension that Donald Trump is currently exploiting. It’s time that America comes to understand that many of the nation’s biggest disparities, from education and life expectancy to poverty, are increasingly due to economic class position. In some ways I believe the Left has become anaesthetised by its Post-Modernist type research agendas, which focus on gender, race, sexuality etc at the expense of a recognition of the primacy of economic class conflict in explaining trends within capitalism. I’m not suggesting issues relating to gender, race, sexuality etc are not important but if they subjugate class then the outcomes that might be derived from this type of research are, in my view, diminished. The data discussed in this article reflects the ‘race-to-the-bottom’ mentality that dominates the neo-liberal approach to wages and income support entitlements. When I was in Kansas City recently I had occasion to catch a bus. It was quite an experience. The two people in my immediate vicinity on the crowded vehicle were discussing their recent release from prison. The white male person was on his way to have it out with his ‘missus’ despite her apparently having an apprehended violence order against him to prevent such engagement. The language being used was very ripe. When I told an American colleague later that evening that I’d caught a bus he replied: “no one catches a bus” – a statement of income and social class differentials rather than anything literal. Quite clearly, no one like myself (income group) catches a bus in Kansas City. What is all of this got to do with John Atkinson Hobson? In 1889, Hobson published with co-author Albert F. Mummery the work – Physiology of Industry – which carried the sub-title “Being an Exposure of Certain Fallacies in Existing Theories of Economics”. It was a very hard-hitting book, which advanced the so-called under consumption hypothesis that exposed the deficiencies of the existing Classical view embodied in Say’s law. Hobson was an interesting character and an early victim of the mainstream economic Groupthink that actively filters out any elements that try to contest the orthodoxy. The mainstream economists of the day essentially blackballed Hobson and prevented him accessing any academic job after that. His 1938 autobiography (2 years before his death) – Confessions of an Economic Heretic – documents these matters in great detail. Upon publication of this book, he was sacked as a lecturer at London University – considered to be too radical. He worked the rest of his life as a writer, journalist and public speaker outside of the academic network. The object of production is to provide ‘utilities and conveniences’ for consumers, and the process is a continuous one from the first handling of the raw material to the moment when it is finally consumed as a utility or a convenience. The only use of Capital being to aid the production of these utilities and conveniences, the total used will necessarily vary with the total of utilities and conveniences daily or weekly consumed. Now saving, while it increases the existing aggregate of Capital, simultaneously reduces the quantity of utilities and conveniences consumed; any undue exercise of this habit must, therefore, cause an accumulation of Capital in excess of that which is required for use, and this excess will exist in the form of general over-production. The underconsumpsion theory pre-dated Hobson and Mummery. In fact it can be traced back to the French mercantilists of the C16th. This mainstream view was summarised by Say’s Law, following the writings of French economist Jean-Baptiste Say, who Marx described as being “tedious” and a “miserable individual” (See Theories of Surplus Value Vol 2, Chapter 17 (para 705)). The classics (Ricardo following Say and others) denied the existence of involuntary unemployment – that is, that a person could be unemployed against their will. They considered that the labour market would always ‘clear’ through wage movements (demand equals supply). This level of employment would mapping into output supply via the given technology. More productive capital, more output for a given level of employment. How do we know that the level of output supplied at any point in time will be sold? Say’s Law is invoked to assume away any problems in matching aggregate spending with this supply of goods and services. The political ideology that we term classical liberalism is the foundation of the free market perspective in economics and sees very little role for the state. So in the minds of the classical liberals there could never be unemployment or production gluts due to a fall in consumption (rise in household saving) because interest rates would move down to increase investment to meet the rising saving. This meant that if consumption fell away (and saving rose), firms would just gear up to satisfying investment goods production instead of consumptions goods production – the rise in saving would increase the flow of funds into the loanable funds market and drive down interest rates and stimulate investment. The idea is sometimes summarised by the epithet – “supply creates its own demand”. The logic is that by supplying goods and services into the market, beyond the output intended for own-use consumption, producers are signalling a desire to exchange their surplus output for other goods supplied into the market. In other words, everything that is supplied is simultaneously a desire to demand (for own-use or for exchange). If you give the idea a seconds thought you will want to know how machinery and physical capital designed to pump consumption goods out suddenly metamorphise into new machinery and capital capable of producing investment goods (machines etc). If you study economics via a mainstream course you will learn that capital is assumed in their child-like ‘models’ to be malleable (putty) that can just be squeezed into different shapes and forms at will. It is looney stuff yet lecturers each day pump this stuff out in mainstream production, growth and distribution theory courses. Rather Keynes showed that it was income adjustments that brought aggregate demand and supply together and the capitalist economy could get stuck in a situation where output levels (supply) were below the level required to fully employ the available labour force. Further, because the firms were able to sell all they produced at this lower level of output there was no incentive to expand production. The remedy was to introduce an exogenous spending shock to break this under-full employment equilibrium and that became the modern justification for fiscal interventions. How could the belief in the preservation of purchasing power be maintained for so long? In my view for two basic reasons: the class interests of the capitalists and the apparent corroboration of the law by experience of the individual. A doctrine which ruled out general overproduction made the capitalist system appear capable of full utilization of productive resources and dismissed cyclical fluctuations as insignificant frictions. These apologetics were facilitated by the application to the economy as a whole of the experience of housekeeping where clearly a lesser consumption means higher saving. But whereas the income of the individual is given, the national income is determined in a capitalist system by consumption and investment decisions, a fall in one of these components by no means leading automatically to a rise in the other. Thus individual experience does not correspond to the course of the economy as a whole. So from that very insightful passage you learn a lot of things about macroeconomics that can be applied to understanding the present situation. Please read my blog – Money neutrality – another ideological contrivance by the conservatives – for more discussion on this point. But Hobson, who operated in the Fabian tradition (he lived in London when writing about underconsumption), was a key link between Marx and Keynes in this regard. Despite coming from a privileged background, Hobson was deeply affected by the poverty in England in the second half of the 19th century. He believes the laissez-faire approach of classical liberalism was incapable of resolving the poverty, unemployment, shocking working conditions and an ineffective education system. He worked within the so-called Social Liberal tradition, which opposed the free market ideology but also rejected classical Marxism. He considered the state to be important in maintaining society’s interest in individual well-being, where the poorest could be made richer through decent employment and inclusion. His underconsumption theory was grounded in the idea that the distribution of income mattered. If workers are deprived of adequate incomes and the rich save a lot, the commodities produced by the current capital stock will not be fully consumed. So to answer the question: why is there too much saving and too little consumption, Mummery and Hobson argued that the distribution of income was defective, in the sense that workers received too little income. However, if some people receive too much income this will be saved and the problem of under consumption will worsen. He advocated redistributing income to low earners – that is, greater equality – which they argued would reduce the capacity of the wealthy to save and put more spending power into the hands of those with low savings propensities. They advocated stronger trade unions, better pension schemes and other social wage benefits for low income families as a means of redistributing national income. They also considered the role of the state to be important to introduce regulations that would ensure surplus income held by firms in excess of what might be considered reasonable would be redistributed to support minimum wages, various worker compensation schemes, reduced working hours and other improvements. They also advocated highly progressive income tax structures to further redistribute income towards the low income groups. Many of these suggestions would fit easily into a progressive policy agenda to this day even if some of the aspects of their underconsumption theory have been undermined since (for example, by Keynes in Chapter 23 of the General Theory). The important point that we get from that part of Hobson’s work is that income inequality is bad for growth. That resonates today. In 1894, Hobson published another of his major works – The Evolution of Modern Capitalism: A Study of Machine Production. It is a masterly tract. Essentially, he argued that a “high-wage economy” was essential to ensure the relationship between real wages and productivity was kept intact. He thought that if productivity growth outstripped real wages growth then and underconsumption crisis would be the result. This idea clearly linked these two great works by the author. In other words, nation should strive to achieve a high-wage economy with high levels of consumption that such an approach would permit. At the time of writing, he was clearly anticipating the beginnings of the mass production factory system, which required stable rates of consumption growth for its continuity. The satisfaction of new good human desires, by endowing life with more hope and interest, will render all intelligent exertion more effective, by distributing demand over a larger variety of commodities will give a full utilisation both of natural and human resources, and by redressing the dislocated balance of production and consumption due to inequality of purchasing power, will justify high wages by increased fullness and regularity of work. If there are theoretic economists who still hold that “a demand for commodities is not a demand for labour,” they may be reminded that a paradox is not necessarily true. In fact, this particular paradox is seen to be sustained by a combination of slipshod reasoning and moral prejudice. The growing opinion of economic students is veering round to register in theory the firm empirical judgement from which the business world has never swerved, that a high rate of consumption is the surest guarantee of progressive trade. The surest support of the “economy of high wages” is a conviction that will operate as a stimulus to industry through increased consumption the working classes, especially in the United States and in England, show a growing tendency to employ their high wages in progressive consumption. Upon the steady operation of this tendency the economic future of the working classes, and of industry in general, largely depends. That sort of reasoning became mainstream after the publication of Keynes’s General Theory in 1936. It also became mainstream that if non-government spending was insufficient at any time then the state had the fiscal capacity, via spending and taxation policy changes, to redress the shortage and maintain full employment. With the onset of the neo-liberal period around the mid-1970s, this belief in the responsibilities and capacities of the state or downplayed. Further, the view was promoted that the suppression of real wages growth in the face of ongoing productivity growth was good for business because it enabled more of the national income to be redistributed to capital. What Hobson could not have foreseen was the dramatic rise of the financial sector, its deregulation in the 1980s and 1990s, and the rise of the financial engineer as a consequence. If the capitalists had only achieved the suppression of real wages growth and rising income inequality, then the sort of problems that Hobson wrote about would have surely transpired. As I wrote in this blog – The origins of the economic crisis – capital found a way around the under consumption possibility as income was increasingly re-distributed towards it via pernicious industrial relations legislation, mass unemployment and the like, by exploiting the possibilities presented to it by the financial market deregulation. Indeed, the strong lobbying the governments caved into in this area was motivated to find a solution to the underconsumption problem that the ongoing redistribution of income would have presented. In the past, the dilemma of capitalism was that the firms had to keep real wages growing in line with productivity to ensure that the consumptions goods produced were sold. But in the recent period, capital has found a new way to accomplish this which allowed them to suppress real wages growth and pocket increasing shares of the national income produced as profits. The trick was found in the rise of ‘financial engineering’ which pushed ever increasing debt onto the household sector. The capitalists found that they could sustain purchasing power and receive a bonus along the way in the form of interest payments. This seemed to be a much better strategy than paying higher real wages. The household sector, already squeezed for liquidity by the move to build increasing federal surpluses were enticed by the lower interest rates and the vehement marketing strategies of the financial engineers. The financial planning industry fell prey to the urgency of capital to push as much debt as possible to as many people as possible to ensure the ‘profit gap’ grew and the output was sold. And greed got the better of the industry as they sought to broaden the debt base. Riskier loans were created and eventually the relationship between capacity to pay and the size of the loan was stretched beyond any reasonable limit. This is the origins of the sub-prime crisis. It is also an unsustainable growth strategy. 1. The financial markets have to become more strictly regulated and that includes the outlawing of a range of currently legal financial products, which have no productive impact at all. Household credit has to be related more closely with capacity to pay rather than the marketing skill of the financial engineer. 2. The growth of real wages has to be brought back in line with the growth in productivity to avoid the underconsumption threat in the face of more reasonable rates of credit growth and household debt accumulation. Hobson’s work still resonates in this regard. What would the minimum wage in Australia be today if had grown in line with productivity growth during the past forty years? Where can you find how the missing workers share was distributed? Uniformly among all employers?Are employers across all sectors enjoying increased profits? Predominantly to finance capital or speculators in land? Predominantly to firms who have relocated to even lower wage nations? to the lower levels of involuntary unemployment? to read of facts and theories which support my convictions.Hands up to confirmation bias. the primary role of the class conflict, it may be that the post-modern perspective may shed light on the erroneous a priori assumptions that lead to neoliberalism. The simplistic early models of how the economy works are, according to my reading, were based on the inappropriate appropriation of equilibrium models of 19th century physics, a distinctly modern as opposed to post-modern perspective. By contrast, the post-modern is highly skeptical of “truth” received outside a contextual framework, ie: the ”child-like” models. The uncertainty in the “assessment” of risk based on securities composed of heterogeneous bundles of subprime mortgages, as well as the failure of the Gaussian hypothesis to correctly price the derivative instruments in equity markets, highlight the failure of what is euphemistically called “mathematical economics”. As you have said : “My profession is a total disgrace and our arrogance leaves us blind to reality. However, if non MMT economists like Richard Wolff are beginning to see the big picture, dare I say even the public purpose, perhaps there is hope for the profession’s rehabilitation. despite fiscal stimulus and low unemployment what’s missing? Underconsumption is always and everywhere, a wealth problem. Interesting point Kevin Harding. Japan has experienced debt deflation and a large private sector debt load. As for the wages,the population is divided in people stuck on temporary wages and the other half in sensible contracts with wages. This also explains why so many are under pressure to work longer hours (even in the public sector) as increasingly a basic working week is not viable to support a decent living standard in spite of the obvious growth in productivity world wide through large economies of scale and accelerating application of new technology to almost every aspect of social and industrial processes (that includes administration). this reminds me somewhat of steve keens’ main thesis although his premise is slightly different. keen posits that it is banks/financial sector which captures an increasing care of national income at the expense of the worker’s wages,So capitalist maintain a steady share despite an increasing cost of finance by reducing (or not increasing) wages.Until ofcourse the very end when the capitalist profits collapse after the workers wages have been completely eroded. this is of course based of a model,so I wonder if this can be empirically measured.